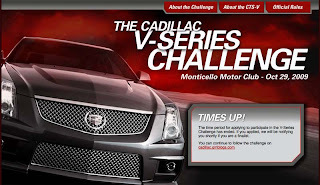 The Auto Marketing Blog: Was the CTS-V Challenge a Marketing Win? Let me get four things out of the way before my post-game analysis of the CTS-V Challenge as a marketing event. First, I love it that Bob Lutz challenged the media and followed through on it. Bob is a legend and this is why. He is a car guy through and through. Second, I think the event was a marketing success (you can stop reading now if you don't care why I think this.) Thirdly, the CTS-V is a fantastic car. Everyone felt it was competitive and it proved that, even though most race fans will tell you racing is 90% driver and 10% car. Finally, every time a marketing company does a challenge/race it is always tilted in the host's favor. It isn't about racing; it's about promotion. Now that I have that out of the way, let's look at the CTS-V Challenge in full and most importantly understand why it was a marketing success and what other marketing teams can learn from it. The idea all started when Bob Lutz made a comment at the press conference launching GM’s latest marketing campaign “May the Best Car Win.” Lutz “told reporters he would challenge anyone in any production sedan to a race around Mazda Laguna Seca Raceway and try to beat him,” What’s interesting here is this wasn’t an idea that started in a creative brainstorming to figure out how to market the CTS-V. This was Bob being Bob and later the automotive blog Jalopnik being Jalopnik. The event probably would’ve never happened if it wasn’t for Jalopnik egging GM to commit to the challenge Lutz made. GM decided to come through, probably after watching some of the early buzz the social media was lending to the idea of such an event. Eventually applications were being taken at this micro-site. In the marketing ideation for the event, some things were added that would later annoy most of those looking forward to the event. Sure Bob Lutz would race but GM also decided to stack the chips in their favor. The racetrack changed from Laguna Seca to the Monticello Motor Club in New York, the same track GM prepared for their CTS-V Nurburgring time. This is notable because it is a track the GM Team was very, very familiar with. Just like in golf, in racing, the more you practice on the same course the better you get to know it and improve your game. The other challengers definitely lacked this advantage. Also, GM showed up with a ton of drivers ready to make sure if someone beat Bob that the CTS-V would still win. Most notable at the event was John Heinricy who set the Nurburgring time and was the ringer of the group. This stacking the deck with several drivers also became a way for GM PR to say things like CTS-V wins 6 or the 7 top spots in the challenge. Marketing at its best. Where many enthusiasts felt slighted was that it was supposed to be Bob versus the challengers and when looking through the original intent of the challenge the CTS-V placed second to a 20 year old with a BMW M3. The driver, an unknown named Michael Cooper, who certainly had some track experience (everyone is trying to find out how much) but he definitely isn’t a professional or some sort of ringer like Heinricy or some of the others GM brought. Now that a couple days have passed, it’s time to look at how the Challenge did in social media conversation. On Twitter the most re-tweeted blog was Banovsky’s followed by GM’s own blog post on their Fastlane site. 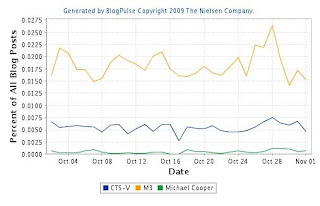 But a lot of blogs covered the event as we can see in this Buzz Metric’s report. We can see in the graph that the CTS-V gets a decent lift in conversation with several automotive blogs covering the story. There is even some momentum going into the event. It’s also noteworthy to see the lift the BMW M3 gets and the unknown driver Michael Cooper receives from the coverage. This is part of the problem with doing challenges. Sure your product gets talked about but so do all of your key competitors thus raising conversation for all brands. The side-effect is that everyone in the challenge sees some positive lift and gets marketed too. Michael Cooper and his M3 also became the enthusiast favorite, after reading several blogs that covered the CTS-V Challenge, because it won on the merits of the original concept and, felt by many, to be the true winner of the event. Edward Boches, Chief Creative Officer/Chief Social Officer at Mullen, shares a perspective on a recent episode of the marketing show The Bean Cast that “social media creativity is about inspiring others to tell stories for us,.. or to invite them to co-create those stories with us.” This is the new creative execution. Cadillac’s CTS-V is a perfect expression of this new creativity. The Challenge definitely spurred a lot of conversation about Cadillac with enthusiasts. There was a lot of braggadocious talk from brand advocates supporting their own favorites before and throughout the event too. Cadillac did miss an opportunity in the Twitterverse by not defining a hashtag for the event. Hashtags are a way to thread a conversation on Twitter that everyone can use to follow a topic. In the early stages of the race, Jalopnik defined the event as “#JalopnikvsGM”. Here is a tag cloud showing how that conversation went. There was also some traditional media coverage when NPR’s “All Things Considered” show interview Bob Lutz that afternoon and the NY Times blog picked the story up too. Buzz overall was very strong for the event and they did get a nice lift in the social media space making it a success by Boches definition of creative marketing success. What also went very well was the promotion of the event through social media, GM has a significant number of people on Twitter and strong relationships with several blogs to get the word out. Their team was tweeting when the event began at 10am and continued well into the evening after the results. Having a lot of bloggers out on Twitter talking about it helped even more since the idea wrapped a very vocal, socially adept community right from the start by challenging the bloggers. So they were part of the story from the start, whether they raced or not. The event also provided a lot of different angles for the conversation to go. It was controversial and led to further coverage and conversation. One of the best write-ups came from the contestant from The Truth About Cars, Jack Baruth. Baruth shared his experience in details along with the excuse for his Audi S4 placing so poorly (poor production brakes) and GM being gracious enough to let him drive Lutz’s car. The whole idea of "ringers" at the event really led to a lot of conversation which really got everyone talking. The best part is the product was front and center. Everyone who covered the event talked about the CTS-V and that's what GM really wanted. So this got me thinking. How about a drag race with all of the Big Three Pony cars? Lutz can drag the Camaro SS. Ford’s Mark Fields can use the Ford Mustang GT500. Chrysler group’s Olivier Francois can show up with their Challenger SRT8. And this time no ringers. Great observation and article. Now, did 6vs8.com have the same intent or was the execution of it, off? And did the competitors get a lift - I'm assuming so. Thank you. In regards to 6vs8.com: I believe in Kaizen. Continuous improvement tells us that no process can ever be declared perfect, there is always room for improvement. And yes the competitors definitely get a lift in any comparison ad. For example, the Pepsi Challenge gave Coke a ton of "free" lift.